With the mercury nudging 30 degrees centigrade Sunday’s Green Wheel Relay became more of an endurance test than ever, writes Barry Warne. The 50-mile, seven-leg race which takes place on The Green Wheel cycle network, is one of the more infomal fixtures on the local road racing calendar but it is always guaranteed a good turnout. The overall winners on Sunday were Fenland Running Club Stompers, who crossed the line in 5:49.36. It was all to play for on the final leg from Stanground Lock to the Embankment track with ‘Ramsey Rockets’, a team consisting of members of Ramsey Road Runners, completing the sweltering course, just a few steps back in a time of 5:50.18. The Stamford Striders ‘Runfast’ team were also in the mix finishing third in 5:52.01. Of the Peterborough-based teams the ‘Thorney Super Vets’ did best, finishing fourth and taking the men’s veterans team prize with a time of 6:14.05. 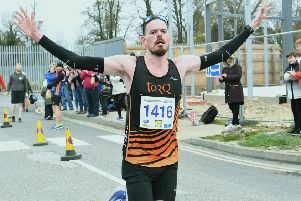 The team was a who’s who of local veteran running talent, of which Thorney Running Club has more than their fair share. The star turns for the ‘Super Vets’ were Kirk Brawn, who finished second in the 8.3-mile first leg from Peterborough to Eye in 50.48, and Darren Hire, who was third fastest on the penultimate leg of 7.6 miles from Norman Cross to Stanground Lock with a 49.03 clocking. Despite finishing seventh, the Bushfield Joggers ‘Bushy Hares’ team supplied one of the best runs with Brian Corleys recording the quickest fourth leg, completing the 8.6-mile stage from Etton to Ferry Meadows in 51.12 - over two minutes quicker than his nearest rival Stamford’s James Skinner.